Other typical VAF applications include Cooling Tower, Pre-RO, Desalinization, Water & Waste Water. Unique “Bidirectional Hydrodynamic Drive” (BHD) patented design provides minimum discharge of water – less than 1% of total system flow – during cleaning while maximizing filter screen cleaning efficiency. Manufactured in the USA, the only automatic filter offering a “no leaks” body design (no external motors, shafts or seals); 316L Stainless ASME body designs and construction provides superior component longevity. 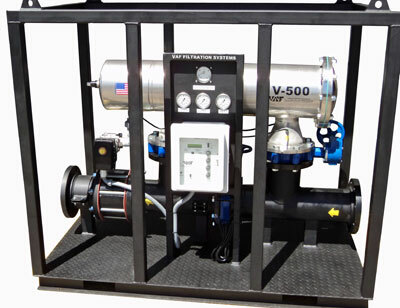 Virtually limitless flow rates and various degrees of filtration are available from 1500 to 10-micron.